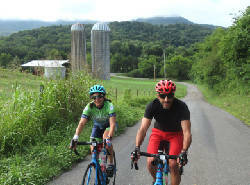 A new online database highlights tested, safe and scenic cycling routes at a variety of distances in the Sequatchie Valley. The database, called Bikeways of the Scenic South and available at scenicbikeways.com, will soon expand to other rural areas in the region. The site gives a multitude of routes with turn-by-turn directions. The project is a collaboration between area counties, the Southeast Tennessee Tourism Association, Shannon Burke of Velo View Bike Tours, and Jim Johnson of BikeTours.com. Part of the routes will be tested at the new Cycle Sequatchie event this fall. Organizers hope participants enjoy the event's routes and return on their own. The routes currently include Marion, Sequatchie and Bledsoe counties and will soon expand to Three Rivers Way (Bradley, Polk, McMinn and Monroe counties) and Georgia Highlands (Northwest Georgia). "While our region has some of the most scenic cycling roads anywhere in the country, finding those low-traffic backroads has not always been easy," Johnson, an early proponent of the regional scenic bikeways concept, said via a release. "Bikeways of the Scenic South will help both visitors and residents discover these beautiful backroads. Additionally, bicycle tourism is sustainable: It doesn't cause the damage that many kinds of mass tourism bring." The finished Sequatchie Valley maps include 12 routes that roll through farm country, up the Cumberland Plateau, through the valley and along miles of country roads. Distances vary between 4.6 miles and 56 miles with most between 25 and 50 miles. Each route is downloadable and printable and can be uploaded to bike computers with mapping technology. The maps give turn-by-turn directions with a full topographical overview. The site also gives short descriptions of each route. "The narratives don't just describe the roads, scenery and landmarks, but also talk about where to stop for a drink and a snack and where to eat after the ride," Burke said via a release. The effort was coordinated by SETTA, part of the Southeast Tennessee Development District. The organization sees the project as an economic driver for the rural areas. "Cycling is big business and has proven to be an economic tool in many communities across the country," SETTA tourism coordinator Jenni Veal said. "It makes sense for our region to invest in cycling infrastructure because it's very inexpensive to do but has big economic impacts."